The city is still seeking volunteers to help rebuild Turner Creek Park this Saturday. Hillsboro will soon be home to a brand new playground. One that will be built in just one day. This Saturday, Aug. 25, volunteers will be taking part in rebuilding the playground at Turner Creek Park with KaBOOM, a nonprofit organization that assists communities in building playgrounds for children. It won't be the first time Hillsboro will benefit from the nonprofit's efforts. Two years ago, 240 volunteers joined together to build McKinney Park in less than six hours, according to the City of Hillsboro. Now, another KaBOOM playground is coming to Hillsboro. 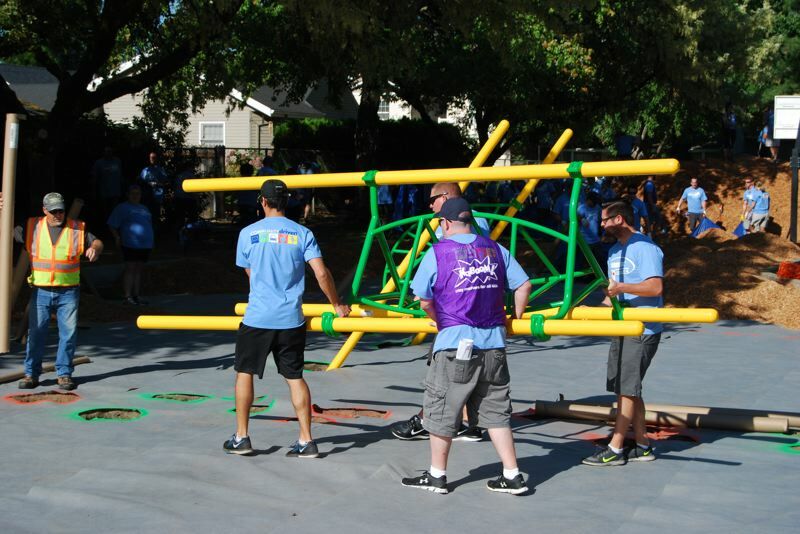 The playground is funded by a grant from the Pacific Life Foundation through KaBOOM, according to the City of Hillsboro. Last spring, the city received a grant to replace the 26-year old Turner Creek Park playground, said Hillsboro's community resources manager Mary Loftin. Since then, city officials have worked with both the nonprofit and parents and kids in the neighborhood to finalize a design for what the new playground should look like. There will be many more changes made than just building a new playground, however. "(The playground) is honestly in a bad location within the park," Loftin said. "It's kind of nestled in the trees in a mossy, wet kind of area, and when the opportunity for the grant came forward, we saw the opportunity to actually move the playground into a much more visible location." Volunteers will also work on landscaping and planting, improve the trail which leads from the park to W.L. Henry Elementary School, paint benches, refurbish dug outs of baseball fields, build a backboard for the tennis courts for single-play and rebuild the picnic tables, among other projects, Loftin said. Volunteers will be fed breakfast, lunch and snacks, and a supervised kid-play area will also be available. The park is expected to be finished by 2:30 p.m. on Saturday, Loftin said. "It's a very exciting day," she said. "It's just a tremendous gift. It's a grant that we are receiving, so there aren't any tax dollars being used and the kids and the people in the neighborhood are going to get a brand new playground. We are able to really a spruce up an entire park because we got this one grant." Those interested in volunteering to build the playground can sign up online at Hillsboro-Oregon.gov/ParksVolunteer or by calling 503-615-3479.